Don't mind the massive close up of my face ha. Just wanted to show a good before and after shot of the new mascara that I am using at the moment. Pretty impressive right? However it was not the look of this DreamWeave Mascara that won me over, it was the fact that is does not smudge AT ALL. When I say smudge, I mean that kind of melted mascara thing that leaves a horrid black smudge under your eyes. That just doesn't happen with this mascara. It has a really odd different formula that you only really realise when you remove it. Now this is really hard for me to explain so bear with me. You know how when you remove mascara normally, the eye make-up remover kind of 'melts' it down and you then wipe it off. Well this mascara comes off in one big mess-less gloop. So no panda eyes, no having to use lots of cotton pads to get the last bits of mascara off. It is so easy to remove - there is not a trace left after just one wipe of a cotton pad. I have been fully converted to this mascara, mainly because I don't have to worry that any of my mascara has end up under my eyes throughout the day. The lengthening and volumising effect is pretty good too - you can see for yourself. The brush is also nice and thin and bendy so you can get all the little, tricky corner lashes. If you are frustrated with your current mascara I would certainly give this one a good. It's a great improvement on the traditional mascara. The link to the online store is clickable through the price. But yeah...to the mascara. :P It gave you such good length and I love that in a mascara and the price isn't bad too! Gonna check it out! You have such lovely, long lashes. I wish mine were like that. 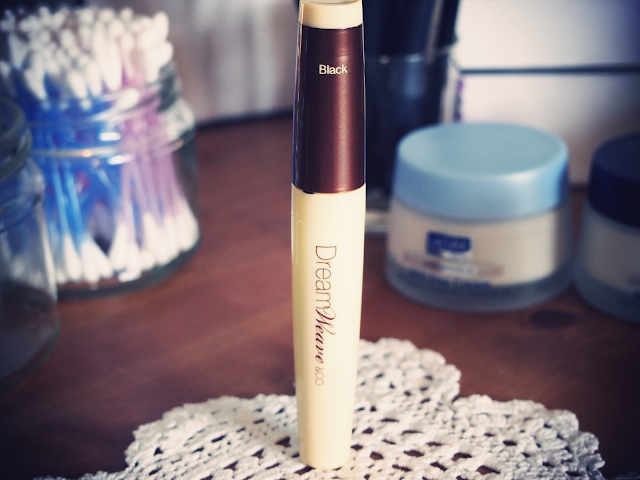 Thanks for sharing the dreamweave mascara. I was searching for the best one for my makeup collection.